If you are an early riser, then we can definitely recommend seeing the sun rise above the skyline of Antwerp. Take the pedestrian tunnel to Linkeroever in Sint-Jansvliet. The unique wooden escalators and the walk through the tunnel are an experience in itself. Once aboveground, on Linkeroever, walk northwards along the Scheldt. Your best view of the city is from the terrace. You will see the sun slowly appear in between the MAS and the cathedral. Check at what time the sun rises so you won’t miss this magical moment. Antwerp is a very popular port for sea and river cruises. The cathedrals of the sea moor in Antwerp near the city’s cathedral, making the arrival in Antwerp a spectacular experience for the passengers on board and the spectators on land. This year, twenty-five sea cruises will cast their anchor early in the morning near Zuiderterras. You have an excellent view of the incoming cruises from the walking terrace above the cruise terminal. Make sure you have your camera with you for that ultimate shot. 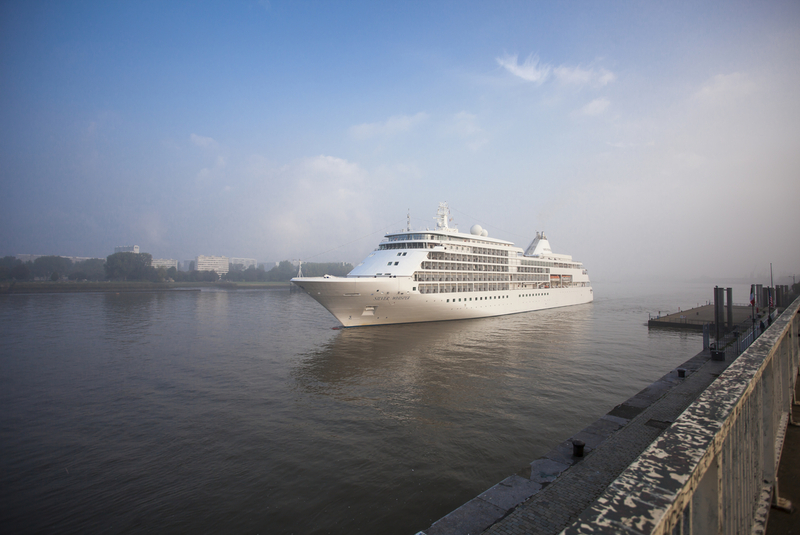 Here is a list of all the sea cruises that will call at Antwerp this year. Did you know that the port of Antwerp stores enough coffee beans to brew about 27 billion cups of coffee? You can see why Antwerp is the largest coffee storage of the world. And you have to admit that a perfectly brewed cup of coffee is the ideal start to any day. There are countless coffee bars around the city, which pour their first espressos and macchiatos as of 8.30 a.m. Fortunately there are a few bars where the really early birds can pop in earlier. In the Eilandje, you can enjoy your favourite coffee at “The Shack”. Enjoy the view of the old port and the MAS from the terrace of this very down-to-earth coffee bar. Caffe Mundi is just a stone’s throw from Grote Markt – which is pretty quiet early in the morning. For a real Italian espresso, head to Caffè e Fiori, near the station in lively Berchem. If you are in Zuid, then pop in to Charlie’s and start your day with a perfect cup of java. Are you one of those heroes who likes to start the day with some exercise? Then you’ve come to the right place. In Antwerp you can go jogging or take a nice walk along the Scheldt early the morning. Why not follow the 3.4-kilometre long poem of Peter Holvoet-Hanssen along the water barrier on the quays. On the other bank, in Linkeroever, you can follow the walking trail along the Maritime Open-Air Museum. Jog along the marina, the beach of Sint-Anneke and follow the curve of the river for the best of view of Antwerp’s port. This is a tip for really early birds. Hop onto your bike at four in the morning and you will see a very different side of the city! Places which are normally teeming with tourists seem desolate. At the same time, there’s life in some really unexpected places in the city. Antwerpen Averechts offers a complete bike tour, which includes a guide and breakfast. We think this is the best way to see Antwerp from a different perspective for you early birds! There are several morning markets in Antwerp from Wednesday until Sunday. If you are up early, then you can be the first to buy the freshest produce or some unique souvenirs. The exotic market in Theaterplein is the perfect place to find local products as well as Moroccan, Turkish and other southern specialities. Score some vintage stuff and objects trouvés in Vrijdagmarkt or organic food at the Bio market. Antwerp’s markets definitely have something for everyone. The earliest birds in the city are Antwerp’s bakers of course. Start your day in Antwerp with a tasty, freshly baked breakfast from Bakkerij Kris. The first rolls are sold at 5 a.m. in the morning in this bakery in the Eilandje neighbourhood. The bakery is quite popular with dock workers who stop for a tasty treat before going to work but there are plenty of Flemish stars and VIPs who also find their way here. Veron is also a familiar name in Antwerp. Students have been frequenting this authentic bakery for their fresh bread and rolls for many years. If you are searching for some delicious, traditional bread, baked by a Michelin-starred chef, then there’s only one address: Domestic. The bakery annex grocer’s of chef Julien Burlat is located alongside his restaurant, Dôme and is definitely worth a visit. If the delicious smell of freshly baked spelt bread is wafting towards you near Mechelseplein in the theatre neighbourhood, then you can’t be far from Konditori. This patisserie opened about three years ago but is already very popular with the locals.